Israel Allowed To Tap U.S. Munitions Cache For Gaza Offensive : The Two-Way The stockpile, located on Israeli soil, was set up in the 1980s as an emergency supply during wartime. The last time the U.S. granted Israel permission to use it was during the 2006 Lebanon war. An Israeli Merkava tank near the Hamas-controlled Gaza Strip border in southern Israel, on Thursday. 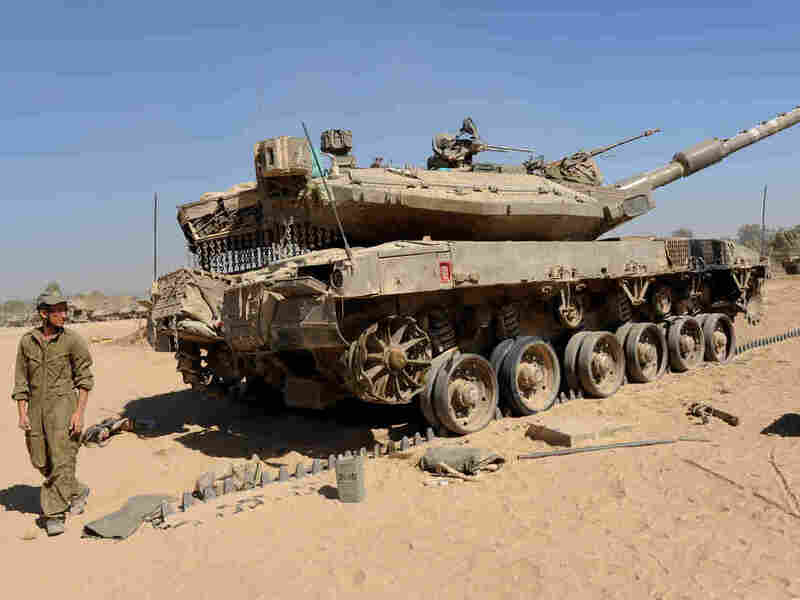 The Pentagon confirms that Israel tapped a U.S. weapons stockpile for tank rounds. A report from the Congressional Research Service says the cache of U.S. arms and equipment, known as the War Reserves Stock Allies-Israel (WRSA-1) program, can be used by Israel with U.S. approval. The last time the U.S. granted access to the arsenal was during the 2006 war against Hezbollah in Lebanon, CRS says. The confirmation comes as the White House today said Israel must do more to protect civilians from harm following an Israeli artillery attack that struck a U.N. school housing hundreds of refugees, killing 15 and wounding more than 100. Both Israel and Hamas accuse each other of a rocket attack on a U.N. hospital. White House press secretary Josh Earnest called the shelling of civilian targets "totally unacceptable and totally indefensible."